She may have come from a Kansas farm or a New York College. She was probably single and in her early 20s. She had dreamed of flying most of her life. 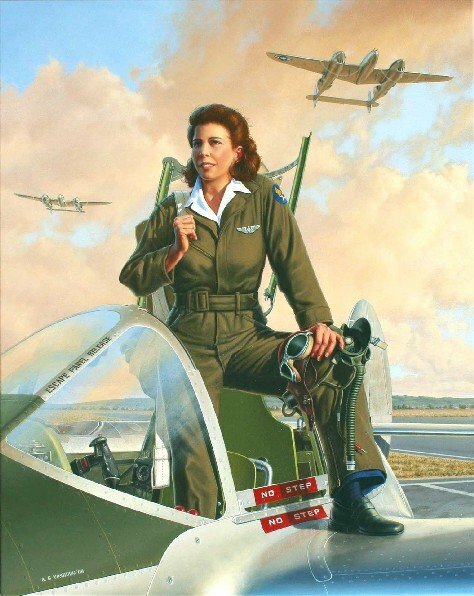 The folks back home said she had “stars in her eyes and the sky on her mind.” We see her standing in the cockpit of a newly minted Lockheed P-38 Lightning. She was flying for the Women Airforce Service Pilots, or WASP of the Army Air Corps. The WASP was formed in 1943 to free servicemen for air combat duties on the battlefronts of WWII. They flew stateside, ferrying warplanes and trainers from the factories to overseas embarkation ports. Many women flew planes towing targets for gunnery schools. Some pilots performed dangerous test flights on refurbished and freshly manufactured fighters and bombers. Others became flight instructors and taught their male counterparts to fly. In a historic decision, Colonel Paul Tibetts, who led the first atomic bomb mission on Hiroshima, recruited an all-female crew to demonstrate the new and fearsome B-29 Super Fortress to the male pilots in his bomber group. Of 1,074 WASP pilots, 39 lost their lives flying powerful and deadly aircraft. They knew the risks, the prejudices and the hardships of flying military planes, but each pilot waved that cost. For these women the thrill of being a flyer while serving their country in its hour of greatest need was the defining time of their lives.